OPEC - What Does It Mean? What is "OPEC"? Why was "OPEC" formed" Which countries are currently in "OPEC"? 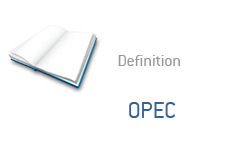 OPEC stands for "Organization of the Petroleum Exporting Countries". OPEC was originally formed in September of 1960 at the Baghdad Conference. The original founding members were Iran, Iraq, Kuwait, Saudi Arabia and Venezuela. The main purpose of OPEC? "To coordinate oil production policies in order to help stabilize the oil market and to help oil producers achieve a reasonable rate of return on their investments." OPEC member nations currently account for 66% of the world's oil reserves and 33% of the world's oil production. While their influence has been lessened due to the discovery and development of major oil reserves across the planet, OPEC's power over the price of oil can't be ignored.